It’s been said that with enough time a cage full of monkeys randomly pounding on typewriters could produce the entire works of Shakespeare. Sadly, the internet has been around long enough to disprove that theory. The moral to this story? One should always look over one’s shoulder when confronting data. Case in point: the porringer. Examples of this small, handled, shallow bowl that date from as late as the 15th century could have knobbed feet and one or two flat eared handles. Examples from the 17th century might have loop handles. By the 18th century, they generally dropped down to a single looped handle. From the early 19th century they got a little deeper in capacity. Porringers have been made in almost every lead-glazed earthenware production center of Europe and (Europeanized) America. It’s ironic that early cups without handles (bowls) were commonly used for drinking, while bowls with handles (cups) were commonly used for eating. So, to name an old bowl as a derivative of porridge, or as the namesake of a stuttering 12th century Monastic bureaucrat? 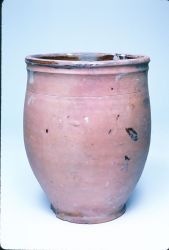 You are currently browsing the archives for the pottery through the ages category.